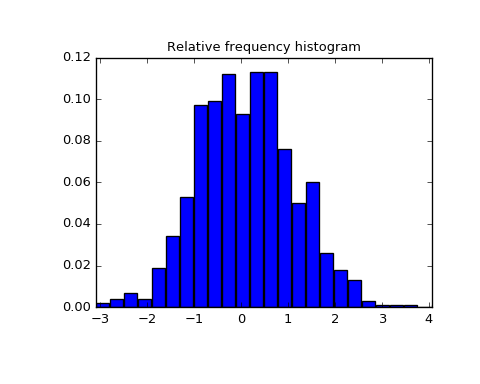 Returns a relative frequency histogram, using the histogram function. A relative frequency histogram is a mapping of the number of observations in each of the bins relative to the total of observations. The number of bins to use for the histogram. Default is 10. The lower and upper values for the range of the histogram. If no value is given, a range slightly larger than the range of the values in a is used. Specifically (a.min() - s, a.max() + s), where s = (1/2)(a.max() - a.min()) / (numbins - 1). Binned values of relative frequency.